ALMOST to the day 17 years ago Steve Ballmer, then boss of Microsoft, the world’s biggest software firm, called Linux a “cancer”, meaning that the open-source operating system would spell the death of proprietary software. On June 4th, his successor, Satya Nadella, announced that the firm would take over GitHub, the main source of such tumours today, for $ 7.5bn. The deal is yet another sign of Microsoft’s startling recent metamorphosis. GitHub is no household name, but among programmers it is as important as Facebook—which explains the impressive price tag for a firm that earned only an estimated $ 200m of revenues last year. More than 28m developers globally keep their code on the website, which offers all kinds of tools and services. Most important of these is allowing software projects, whether open-source or not, easily to pull together code from different contributors. 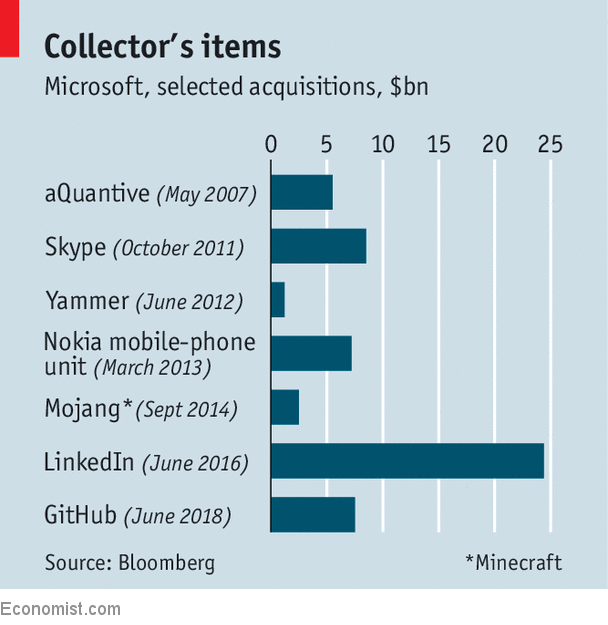 For Microsoft the deal is a homecoming. It used to be a kind of GitHub itself. When Windows, its flagship operating system, ruled computing in the 1990s, developers flocked to it. But the firm lost its role as the main hub for programmers when it got a late start on the internet, fought open-source and missed mobile computing. Microsoft kept pushing Windows everywhere though the world had moved on. This only changed when Mr Nadella took the helm in 2014. He has re-established Microsoft as a firm of platforms, but on a higher level. One such is cloud computing, where it is now a strong number two behind Amazon. LinkedIn, which Microsoft took over in 2016, is another. The social network provided it with access to the range of connections between professionals (the “social graph” in geek) and lots of data. GitHub has to be seen in the same light. Microsoft already uses the service for much of its own software and developers may now be more inclined to write software for the firm’s cloud, Azure. Although Microsoft has promised that GitHub will stay independent and maintain its status as an open platform, many developers, an opinionated group, are not amused. They still see Microsoft as the “Death Star” space station in the “Star Wars” films that kills everything in its sight. But they have got it the wrong way around. The deal is final proof that the rebel forces have won. In most big software markets, open source is now the default. The deal has given Microsoft a push in the race among tech giants to become the first company worth $ 1trn. Its share price jumped by 1% on the news—investors believe in Mr Nadella’s rationale. In late May its market capitalisation had already briefly passed that of Alphabet, Google’s parent. The winner on current trends will most likely be Apple, but Microsoft and Amazon are now at the same level—not bad for a firm that by tech-industry standards is as old as the hills.